Early last month, hubs told me Air Supply was coming. I was a little hesitant (as usual) to leave the kids behind but then on second thought, it’s onlyÂ natural we getÂ a littleÂ time off, a little bit of ‘couple time’, awayÂ from the kids once in a while. Well, really, time out like this does help keep our sanity. 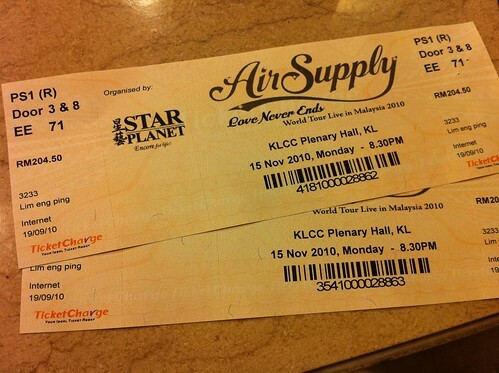 So,Â hubs purchased the tickets and off we went for the concert last Monday, 15th NovÂ at Plenary Hall, KLCC Convention Centre. 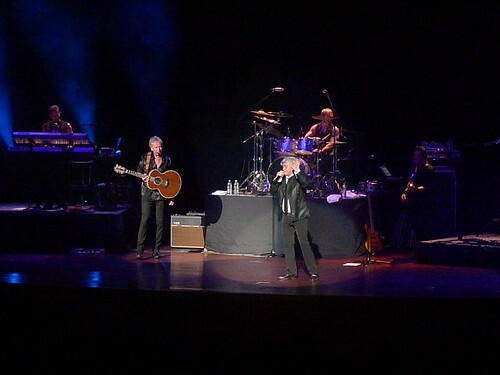 You can read more about the Australian band Air Supply here. Ooo… should I attempt to shake hand with him? 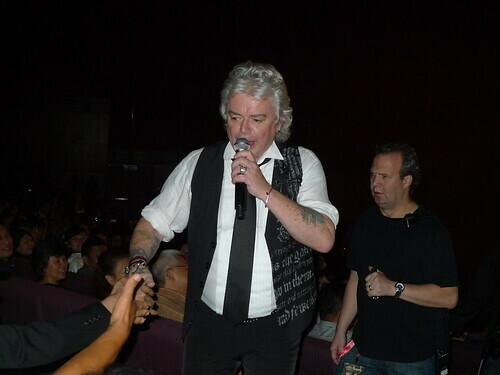 The 61 year old lead singer, Russel Hitchcock. No.. I didn’t shake his hand. Graham Russell, singer – songwrite. 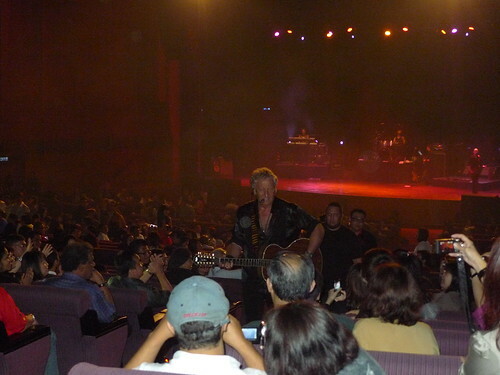 The man behind the many Air Supply hit songs! The sang some of their hit songs such as All Out of Love, Making Love Out of Nothing at all, and many more.Â Graham Russell also sang one of their new songs entitledÂ ’Just a little bit more’, a song about a soldier who was summoned to war,Â leftÂ behind his newly bride andÂ never came home. He claimed this is a song based on true story. In a nutshell,Â we had a fantabulous time. 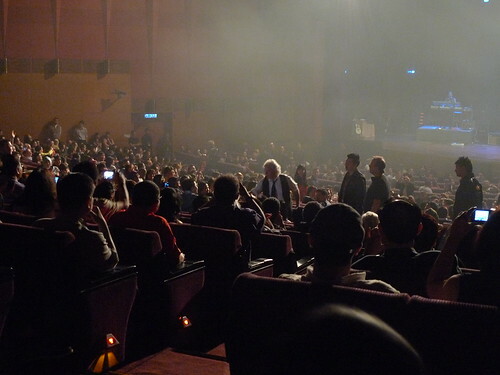 The crowd went roaring for more when the duo bid goodbye after merely an hour.Â They came back on stageÂ and finally ended their concert with the song ‘Goodbye’. Simply too short! Too short! Lil B has been practising for a week or so to perfect his independent stand. IÂ have to agree, he’s pretty good at it now. He could now stand unsupported forÂ about 10 seconds and he could slowly lowerÂ himself down instead of fall flat on his bum bum. 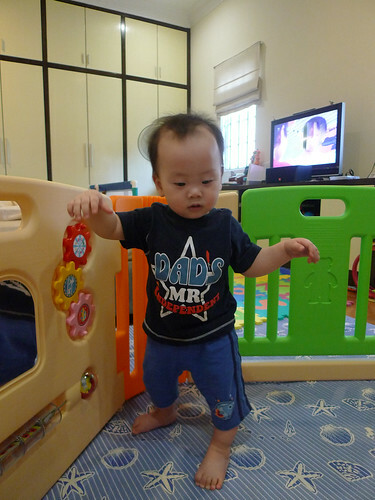 I wonder if he’ll start walking sooner than his kor korÂ who took his first stepÂ at 11 months. We’ll see. Cheeky Ryan. Purposely want to lean on Darren when asked them to pose for me. 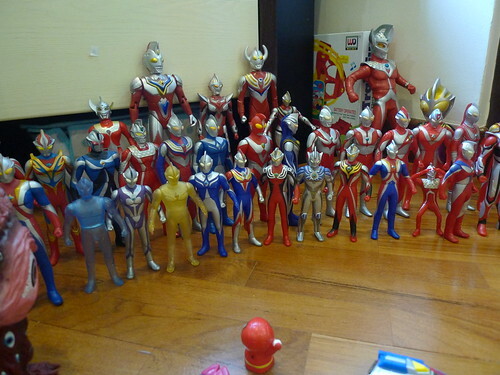 These are part of Ryan’s Ultraman collection. 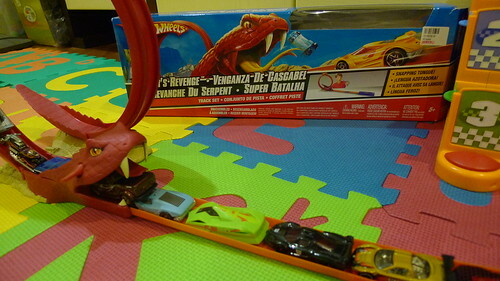 He’s been an avid aficionado since he was 2 yearsÂ old. 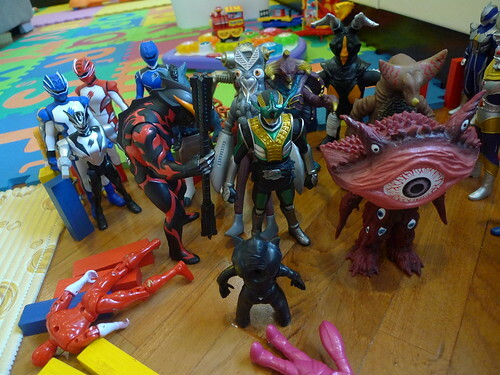 He has about 50 Ultraman (exclude those tiny figurines he collected from twist balls, birthday cakes etc) and a couple of Bandai monsters, Ben 10 monsters, etc. Recently we ordered moreÂ Bandai monsters and some limited edition UltramanÂ from Japan to add on his collection. That cost me a bomb but for the smile on his face, it’s all worth it. 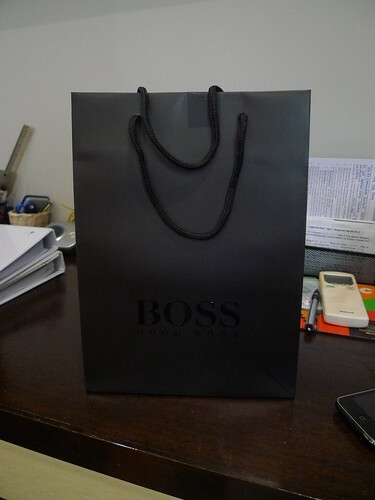 So far I have presented a few to him, especially when I have to go out for long hoursÂ whether it’s to run errands orÂ work related matters, I still have like 10 in the box which I’m keeping for rainy days. …. 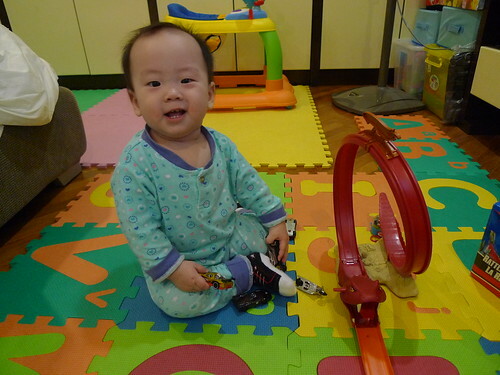 and DiDi get his hands on the new toy when Kor KorÂ is in dreamland (Ryan goes to bed between 7-8pm everyday)Â … LOL. My michelin lil b is now 9 months +. Ironically on the day he turned 9 months, he cut his bottom lips because the air filter fell on him when he was trying to pull himself up. That’s how strong he is… Blood was oozing out and I panicked. I quickly applied cold compress and luckily the cut was not deep. The wound healed completely the very next day. Lil B is very mobile now. He can crawl and cruise like a pro. He could easily pull himself upÂ from any position. 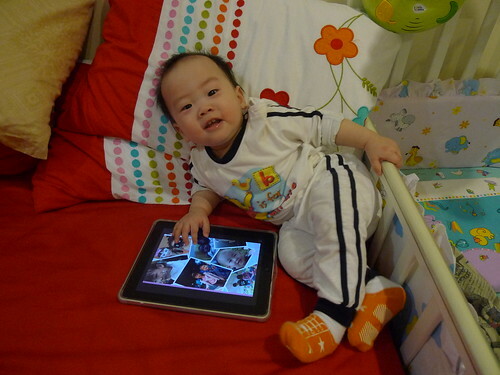 When he’s stucked or couldn’t get up, he’ll get upset and start babbling. So cute. I’m glad Lil B showed no signs of separation anxiety when being separated from me. He is fine being whisked away by anyone in the house;Â anyone whom he’s familiar with. This gives me a little break in between for me to do my own stuff, and a little bit of me time. Just like his kor kor, Lil B is very advance when it comes to teething. At 9 months, he already has 8 teeth (four top, four bottom), cutting his 9th and 10th soon. Â Lil B is a joy to feed. He is a true foodie. He eats everything we feed him. When he sees us eating, he wants his share. Unlike Ryan, lil B show no signs of food allergy therefor we have been pretty relaxed on the choices of food he can consume. I literally lose track of the type of food he had stomached in the last 2 months or so. Whenever we eat something, he would stare at us, babbles pitifully until we give him a taste of what we were eating. He’s truly the opposite of Ryan who is such a picky eater since young. Lil B.. oh Lil B… still pretty much a bad sleeper. There’re still many rooms for adjustment when it comes to his sleeping habit but then again, as a matter of fact I think I have not been strict enough when it comes adjusting his routine. Deep down, I kinda like the fact I could sleep in much later in the morning as opposed to waking up early to an early riser baby. (Lil B will turn in around 12, wakes up around 7am for a milk fix and go back to sleep until 10-11am. H-E-A-V-E-N :P). Ryan likes to give Darren nicknames. 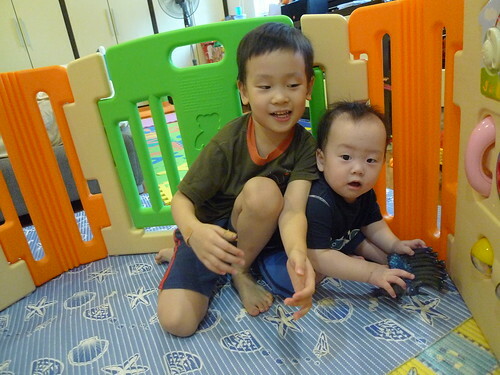 First it was Lil B and for a while now, he calls his DidiÂ ‘ Tickle Boy‘. He said lil B’s name is now Darren Tickle Boy.Â TheÂ story behindÂ the name came about, he said,Â was because lil b likes to be tickled. Then lately, he said Tickle Boy is now Burpy Boy just because of a very loud burp Lil B let out the other day. So, “Darren Burpy Tickle Boy‘Â my dear Lil BÂ is now. Ryan dotes on his Didi a lot. He likes to go near lil B. So he gets very upset these few days when he was refrain from getting near the Didi because of a nasty bug he caught (story in the next post). 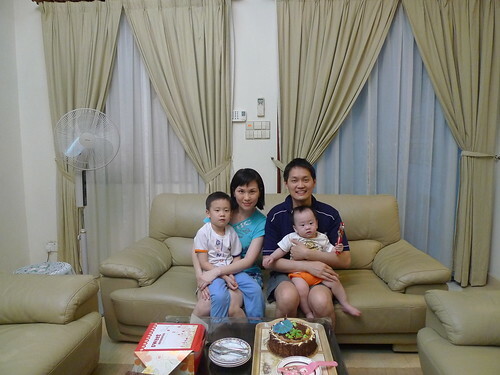 I feel really bad when Ryan asked ‘Mommy, why you always said No, I cannot go near Didi‘. Sigh…Â if only IÂ have a choice. 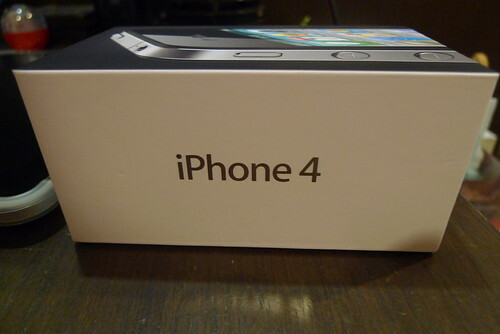 Â For the record, this is the present IÂ surprised hubs on his birthday…. Lil b is now able to mobilise himself around the house (under supervision of course) pretty well. He could speed crawl, he could pull himself up and cruise, and on many occasion he would stand unsupported for a few seconds before he dropped on his bum and laughed over the stunt he had just performed. So we decided to dig out the play yard we bought last time and let him roam around a bigger space.